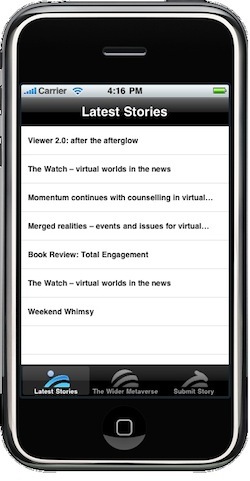 I’m really pleased to be able to announce the availability of The Metaverse Reader, an iPhone application for virtual worlds residents / follower / interested parties. It’s essentially an RSS reader with two sections. The first is our own RSS feed . The Second is a ‘Wider Metaverse’ section, which features a range of virtual worlds related feeds from around the world. There’s only a handful at this stage but we’ll certainly be adding more – there’s been some issues with non RSS 2.0 feeds on some sites, which we’re working with the owners to rectify. The ‘Submit a Story’ section is purely a contact form if you want to make contact. Why wouldn’t I just use my RSS Reader? For some, a broader RSS reader may indeed be preferable. However, we’ve had a lot of feedback that people like a quicker option of a handful of feeds easily accessed. The Metaverse Reader is exactly that. And at under 200KB in size, it’s also doesn’t take up much room. Can I suggest a feed to add? Absolutely – just contact us with the details. Where do I get support for this app? Are there plans to expand the app? Version 2 is already underway – if you have suggestions for improvement, we’d love to hear from you. I do need to give a huge plug to the developer who created the application from the specification provided. Phillip Street is an Australian iPhone developer and contributing writer who happens to live pretty close to me. I couldn’t be happier with his responsiveness and price competitiveness and I’ve already contracted him to work on the next version. So if you have an iPhone, iPod Touch or have managed to be one of the world’s first iPad users, give the Metaverse Reader a whirl and critique away!